Weekend camping, scout camping and summer camp all have different requirements, but there are some items that make your adventure a little easier. After you pack your sleeping bag, clothes, shoes (rain boots if it’s wet out), toiletries, food, water and s’mores supplies, here are a few more essentials to make it easier and more fun. 1) Rope. From creating a run for your dog in between trees, to tying a clothesline for hanging up your dunk bag or any wet clothing, rope is super handy. Bring a knife or scissors to cut it with. 2) Scrubber. An inexpensive kitchen scrubber along with some environmentally friendly soap (Ivory, anything biodegradable) makes dish and pan washing much easier. 3) Dunk bag. After washing your mess kit (or plate and cutlery), you can place it in a drawstring mesh bag and hang it up to dry by looping the string over a clothesline and using a small stick to hold the loop in place. 4) Bucket. Always have water near a camp fire for safety. If you heat up dish water in a metal bucket next to the fire, you can just dunk your mess kit in warm soapy water and then dunk it in the bucket of hot water to rinse. Dunking your mess kit in a third bucket or tub of water with a capful of bleach will disinfect it. And a bucket can also help when you carry toiletries to the showers. 5) Games: deck of cards, UNO, Yahtzee, Mad Libs. None of these take up much room, and they can be a lot of fun in the evening or if you’re stuck inside because of rain. 6) LED lantern. Flashlights are essential, but a small lantern makes evening a bit easier. 7) Glow necklaces to indicate the way to the latrine. Hang them on tree branches to mark your path at night (but still bring your flashlight). 8) Song book. Especially if you’re camping with scouts. Singing the Princess Pat, Make New Friends, or Taps by the campfire makes for some special memories. 9) Hand sanitizer and paper towels. Because there aren’t a lot of sinks when you’re camping, and paper towels are always handy. 10) Trash bags. Carrying your sleeping bag and pillow, hanging up a trash bag at your camp site, putting your muddy shoes and clothes in… Bring a few. 11) Pitcher. To mix up some powdered lemonade or bug juice (powdered fruit drink) for your campers. 12) Coffee pot. A camping coffee pot is a lifesaver for grownups. You can use it on a camp stove or campfire grate. Bring mugs, ground coffee, cream and sweetener as well as a pot holder. 13) Emergency radio and batteries. Either for weather reports or some evening music without killing your phone battery. 14) Camp chair or sit-upon. A lightweight camp chair by the fire is a great way to wind down, but a sit-upon is easy to make and hang on your backpack. It’s anything you can sit upon, like a stadium cushion or a homemade sit-upon, using waterproof fabric and newspaper or plastic grocery bags inside as the cushion. Our scout troop had fun making duct tape sit-upons with inexpensive reusable shopping bags. 15) First aid kit. Small or big, you should at least have some adhesive bandages (Band-Aids), antibiotic ointment, antiseptic/alcohol wipes and tweezers. 16) Yarn. You can finger-weave, finger-knit, braid bracelets or necklaces. You could also use it to mark a trail or play a yarn toss teambuilding game. 17) Sharpie. It’s waterproof and writes on almost anything. Useful for writing names on plates, cups and towels. 18) Ball or Frisbee. There are endless games you can play back at camp after a fun day of hiking and activities. 19) Small binoculars. Great for spotting critters up high and off in the distance while hiking. 20) Paper and pencil or crayons. You can make leaf rubbings, write camp journal entries or letters, and create solar prints using colored construction paper, leaves and other outdoor objects. 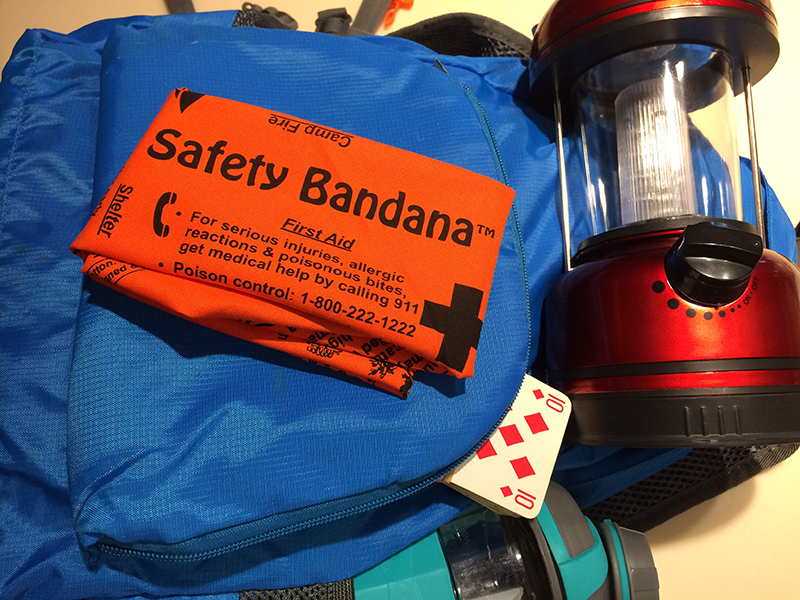 21) A Safety Bandana to help you identify poison ivy, poison oak and poison sumac. And it has first aid, outdoor safety, weather, camp fire, shelter, food, water, and getting found tips, plus a list of backpack essentials.